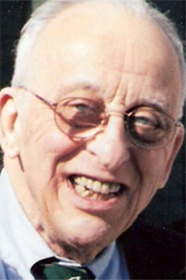 Dr. Robert D. Harwick, born in 1923, grew up in Utica, New York and its environs. He graduated from Cornell University and its medical school. As an undergraduate, he was captain of the golf team. He was good enough that he had to choose between a pro golf career and medicine. Dr. Harwick trained in New York City, interning at Bellevue Hospital and completing his residency in surgery at Memorial Sloan Kettering in 1955, bridging service as a naval officer in a M.A.S.H. unit in Korea from 1950 to 1952. He retired from the Navy as a Lieutenant Commander. He met his wife, Elaine Crandall Harwick, a nurse, when they worked together in New York, and they married within a week of his return from Korea. He began working at Temple University Hospital in January 1956 and became Professor of Surgery and later Chief of Surgical Oncology in its School of Medicine. He served as president of the Medical Club of Philadelphia, the Philadelphia chapter of the American College of Surgeons, the Philadelphia Academy of Surgery, and the Philadelphia division of the American Cancer Society. Dr. Harwick continued operating at Temple into his 70s. Dr. Harwick was loyal and devoted to the institutions that shaped his career and to his family, friends and esteemed colleagues. He was intellectually curious, had a prodigious memory and a playful and dry wit. Dr. Harwick is interred at Arlington National Cemetery. He is survived by his son, Robert, Jr., and daughters, Jean (Hirsch) and Elizabeth (Green) and grandsons, David Hirsch and Peter Hirsch.